Despite our attempts to have Paolo sleep on his own, he is still in our bed. It seems that, in the battle of wills, he has won. He pitches a fit when we go anywhere NEAR his crib and REFUSES to sleep. Yes, REFUSES to sleep in his crib. So, the Pack-N-Play is back up in our room, and sometimes Paolo will sleep in it. But mostly, he prefers to stay nestled between Giuseppe and I.
It’s not that I mind co-sleeping. In fact, I really like it. Giuseppe and I both love having our little schnuggly man near us at night. And it is so much easier when Paolo fusses at night. I don’t have to get up and rock him and/or walk him around until he falls asleep. He just snuggles up and dozes right off…. I’m also reluctant to respond to Paolo’s battle cry when we are leaving for Italy in two weeks and then his world will be turned upside down for an entire month. Is it really worth the hassle and the trauma? I may just give up completely until we get home and lay down new ground rules when we return. Also, to be honest, as it turns out, I’m not the type of mamma who can let my baby cry it out. I’ve given this “sleep training” a solid week, and it is just not working. (Well, not a consecutive week.) And it feels so wrong. I spoke with my pediatrician about it and he said that I shouldn’t let Paolo cry it out until I feel emotionally ready. (He joked that the real cure is to have baby #2 so that I don’t worry so much about Paolo. But it’s a little bit early for that…) He also informed me that it is important to have Paolo in his own crib by the time his is 18 months old, or we will have a family bed until P is about five years old. Which means will still have a little time left to schnuggle. Which is good news. At least for now. We have been trying very hard to teach Paolo to enjoy sleeping in his own crib. But it is just so difficult. Look how adorable my two boys are, all snuggled up. I mean, really, it is difficult to force our little one to stay in his crib. But we will stay strong tonight. There is something so comforting about having a little snugglebutton. Paolo woke up at 1:30am last night with a low fever. So there hasn’t been much of sleeping anywhere except in my arms. He’s still not feeling well, poor baby. When I was preggers, Decorating The Nursery was one of my Top Priorities. I was very specific and painstakingly picked out the furniture, linens, curtains, diaper pail, rug, and you get the idea. What first time mother isn’t obsessed with the first nursery? I ordered a gorgeous white-and-wood convertible crib and dresser/changer. (I blogged that whole debacle here, here, and here.) I chose blue and white linens with a striped/nautical theme. Attached to his crib is a darling sailboat mobile. I hung my little brother’s gorgeous sailboat quilt on wall near the crib. I love my, ahem, I mean Paolo’s, nursery. When I was preggers, I firmly believed that my baby would sleep in his nursery. After the first couple weeks of sleeping in his bassinet in our room, I would smoothly transition him to his room. Hah. Or so I thought. We instead quickly became those parents. You know, those co-sleeping, breaking-all-the-rules-parents. 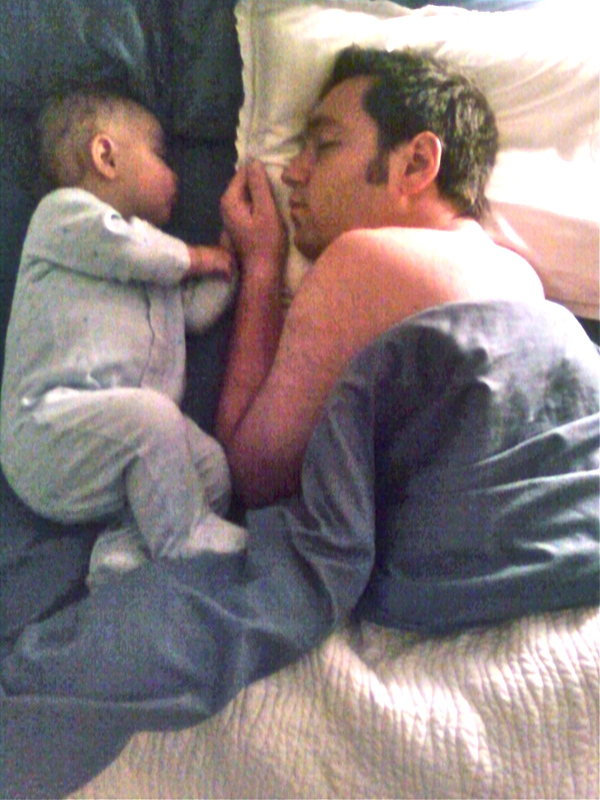 Paolo usually started the night off in his bassinet, but always woke up in our bed. I mean, I am a full-time nurser and I don’t believe in letting my little guy cry it out. (Again, yes, I am that mother.) And breastfeeding plus not-letting-him-cry-it-out equals co-sleeping. Which in turn means no use for the nursery. But then, last night happened: Another momentous day in the Dell’Anna Family History. Last night Paolo slept in his crib. Yes, his crib, in his nursery. Not our room. What changed my ways after nine months of co-sleeping, you ask? Well, we have been traveling a lot and Paolo has been sleeping a little. After a talk with his pediatrician, I decided that maybe it was time to let him sleep in his crib, thinking he may sleep better with his own space. It worked. I fed him a lot, put him down around 9pm and he didn’t wake up until 4:45am. It was incredible. I had the baby monitor on the pillow next to my ear, but I still got up to check on him about, oh, every hour. And he didn’t wake up until almost 5am! He got a lot of sleep, but I didn’t, what with the shuffling back and forth from the nursery to my bed to check on him constantly. Paolo’s in his crib as I write this, fast asleep. While I am happy that he is getting a full night’s rest, and the hubs is grateful for the extra space in the bed, it has been hard having him in the other room. For nine months he’s been in here with us, and now he’s so big and in his room. We’ll see how Night in the Nursery No. 2 goes.